Alfalfa Powder is a supplement that can be blended into vegetable juices, used in baking or in vegetarian dishes. It is 20% protein and 15% fiber; plus it contains 16 amino acids, 13 trace minerals and 13 vitamins. Alfalfa Powder is a whole food supplement highly valued for its nutrition. 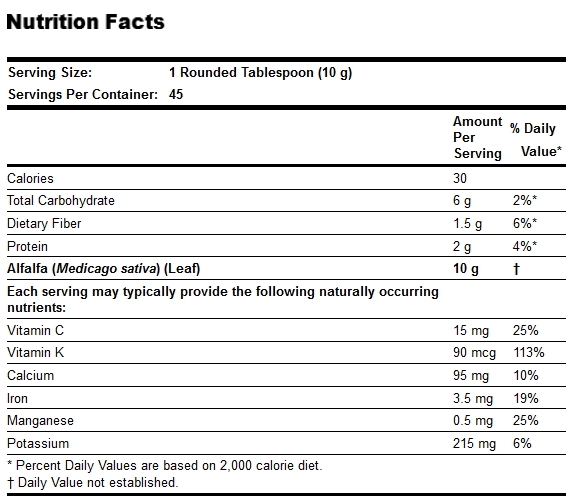 Suggested Usage: As a dietary supplement, add 1 rounded tablespoon of Alfalfa Powder daily to 12 oz. of your favourite juice. Stir vigorously or use a blender. Tomato or carrot juice is suggested. You may also add this to fruit smoothie blender drinks to increase the nutritional content.